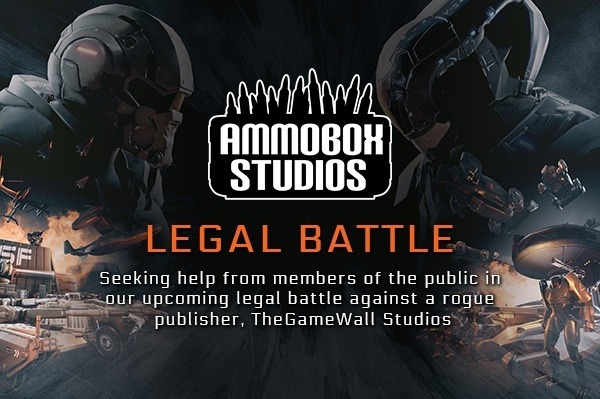 Ammobox Studios is seeking help from members of the public in our upcoming legal battle against a rogue publisher, TheGameWall Studios. In September 2018 Ammobox Studios, a Malaysian-based game development studio launched their first title, Eximius: Seize the Frontline. 8 years in the making, this passion project fell victim to UK-based Publisher TheGameWall Studios. Revenues from the game since launch were stolen. Along with potential revenue due to unfulfilled marketing work promised by TheGameWall Studios. The publisher did not outsmart us in contract wordings or shortchange us , all he did was take all the money and cut off all communication and did not fulfill the promised marketing activity. Weeks after launch , as we cannot bear to see our work of close to a decade die a premature death , we continued to support the game with development updates , patches and marketing activities from our own pocket. We thought a few more weeks this publisher will perhaps reply to us. As days grew to weeks and months, we had to pull the plug. Having our money delayed was one thing , having lost all of it is altogether a different news. However the mother of all bad news was that he is in full control of the application rights in Steam and has locked us out of the finance controls. One week before Christmas 2018 , instead of distributing the planned Launch Bonus to the hardworking team, we had to DMCA our own game in a scorched earth move. Recently we made news (in GamesIndustry.biz) for being a rare case of a developer launching a DMCA strike against their own game. This was a desperate attempt because not only did he withheld our money, he continue to hold on to our Steam application rights even after the contract was terminated due to material breach. We finally manage to regain control of our game with the help of Steam after some legal notice and demands were initiated. However, this is far from over. In total we lost the Launch Sale, Halloween Sale, Autumn Sale, a big portion of Winter Sale and 6 months worth of operation funds that have not been recovered. All funds from other digital stores has also been cleaned out by the time the DMCA hit. The publisher as of today still refuse contact with Steam, game journalists and obviously us. With all our money missing and no revenue, we could not afford to further our legal cause to fight it in the UK. Although the case was a straightforward one, the entry point legal expenses itself is more than a year worth's salary for one person in our country. About a week ago, there has been a wide press/influencer coverage on this case that have sparked interest in us making sure this Publisher never gets to run another day of business ever again. Our Reddit post started trending and attracted the attention of other studios who were affected by the same publisher years ago. Aside from at least 2 studios who already spoke up, one of their investors ( Force Protocol ) . Similarly once he has taken money and run out of excuses , he cuts off contact with them. With this, we begin to realize his Modus Operandi; first he takes the money, delays payment and then completely disappear for a period of time in a gamble hoping that his victims will have no funds to initiate legal action. Mr. Eduardo Fernando Teixeira Monteiro, the sole director of this company is the only common link between all the affected studios. * we want to specially thank SidAlpha for being the first influencer who took note and helped us. As we begin to reach out to the older studios that fell prey to this publisher, we realized that we had to do something. He cannot be allowed to continue to go from studio to studio, snatching all revenue, rinse, wash and repeat. An In-Depth Story can be found here at Gamasutra narrating from our CEO's perspective. GamaSutra - Why did we DMCA our own game few weeks after launching ? As the story continue to develop, many people were outraged and it has likely attracted the attention of TheGameWall Studios' director Mr. Eduardo Monteiro himself. Within 2 days of the news going viral, his website and Facebook page was immediately taken down. We believe there is a glimmer of hope after all. Here are our objectives of this GoFundMe campaign. We would like to raise enough funds to pay our current legal representative to take this case to court and acquire a judgement against his company and him personally. Even if we do not gain anything in this winning or if the court actions aren't sufficient to prevent him from funneling his stolen funds, at the very least, with a proper court judgement and disqualification of directorship, Mr. Eduardo Monteiro will not be allowed to run a company . This is the cause that we want to push. We want to serve justice to him as he has been doing this for far too long; using the system's high legal costs as his shield. Ammobox Studios is a small 10-man indie team mostly based in Malaysia with a few spread across the world. On the 28th of September 2018, we launched our multiplayer FPS/RTS hybrid Eximius: Seize the Frontline in Early Access on Steam. This was a passion project that we began developing about 8 years ago. We are also involved with Games Development Training and Game Development Outsourcing services. Play as a Commander( RTS ); build base, train an army and call down support abilities to help your allies on the ground to gain territory. Play as an Officer( FPS ); lead your infantry squad into combat and crush your enemies with your agile tactics or brute force. Capture resources for your team, upgrade weapons and equip your squad with suitable weapons. At the moment, we cannot afford the cost required for our legal battle against TheGameWall Studios. Our current funds were dried up before the end of 2018 and we're struggling to keep the lights on. With the Steam application rights back in our account, we're able to slowly make headway into recovering. At this point taking legal action is financially impossible. We initially wanted to move on and call it a day on this chapter of life lessons. However, we have been approached by many people to give it a shot to raise funds and made sure this person is put out of business. Just today (30th of January) his company is given a strike-off notice . It is part of the process to close down the company. We believe in our opinion this is likely an attempt to prevent old debts from catching up with him. Things are moving fast and we have limited time. We've negotiated a very good deal with an indie game PR company to help us bring attention to our cause, and will be providing them a minor portion from any amount we receive over our goal. These are great people that understood our strive. Our UK legal representative have advised that we would need at least a minimum of 7,000.00 GBP to 15,000.00 GBP (approximately 9,200 USD to 20,000 USD). We are adding a buffer of USD5,000 for contingencies cost that could arise between. Should we reach more than 25,000 USD, we will use the additional funds to cover the delayed salaries and the debt of the team. For extra clarification, we're not counting on recovered funds to continue to run our business. Our main priority is to procure a judgement against TheGameWallStudios and the director Eduardo Monteiro personally. Monetary donations is one way to help us. You can also help us by sharing and spreading the word about our story and our crowdfunding campaign. You can currently purchase Eximius on the steam store at https://store.steampowered.com/app/505740/Eximius_Seize_the_Frontline/. We will reach out to you with your reward through your associated gofundme email. Lastly, a very big Thank You from the Eximius team! The support shown by members of the game industry and community has truly touched our hearts. Whether you help fund this campaign or cheer us on, we could not have reached this far without your support! Here are some websites and YouTube videos that covered our story. Please check them out.